Registration for the 2018 California Economic Summit is now open! The statewide event takes place in Santa Rosa on November 15-16. The seventh annual statewide gathering of the state's largest public- and private-sector network will advance the progess made in workforce preparation, housing and community development, infrastructure and working landscapes. The diverse Summit network of leaders has championed initiatives aimed at the triple bottom line: seeking to simultaneously advance economic growth, ensure environmental quality, and provide opportunity for all. This year represented a renewed focus on lifting up more Californians and continuing initiatives to build more housing, develop a skilled workforce, and create the infrastructure needed to support them. The California Economic Summit catalyzes public and private sector commitments to the triple bottom line: simultaneous growth in the economy, improvement in environmental quality, and increased opportunity for all. California is leading on carbon reductions and has set some of the world’s most ambitious climate goals. How can we also make sure we are restoring upward mobility and producing middle-wage jobs that allow workers to flourish in a low-carbon economy? California is the epicenter of the tech revolution, but amidst the rise of the robots, many workers fear for their jobs. How do we prepare Californians to thrive in an automated workplace? California has one of the world’s largest, most dynamic and diverse economies. Faced with rising living costs and infrastructure challenges, how can California maintain a competitive advantage? No one else is going to solve this problem for California. The Summit is a civic venture that requires contributions of time, talent and treasure. California Forward and the California Stewardship Network continue to convene hundreds of California experts and practitioners from all over the state. The California Economic Summit’s 2018 Roadmap to Shared Prosperity sets the course for the future. The California Economic Summit, with its sights set on the state's economic mobility problem, has launched the 2018 Roadmap to Shared Prosperity. The updated strategy guide takes on the biggest challenges that are widening the prosperity gap across the state. After sharpening this strategy at the 2017 Summit in San Diego, the Summit’s expanding network of business, equity, environmental, and civic organizations have identified three major new initiatives to help lift every California community into prosperity. The Summit also recommitted to the One Million Challenges, a set of ambitious goals to address workforce, housing, and infrastructure priorities in the next decade. 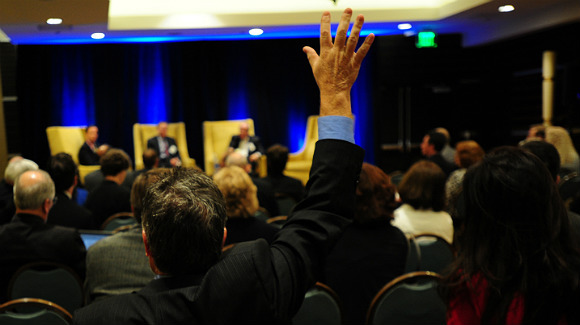 The California Economic Summit gathers together leaders from across the state in an unprecedented way to create shared economic agenda, one developed by private, public, and civic champions from the state's diverse regions with the goal of expanding prosperity for all. 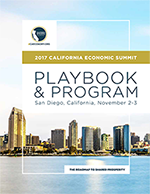 In advance of the 2017 California Economic Summit in San Diego, Summit leaders looked ahead to identify priority areas of action for advancing prosperity over the decade. 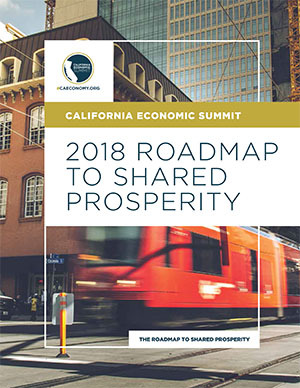 The resulting collaboration at the Summit helped launch the 2018 Roadmap to Shared Prosperity which is focused on accelerating progress in three key areas—Workforce, Housing and Water—while introducing three new major initiatives: pushing the state to set goals and track progress toward restoring upward mobility, ensure rural regions aren’t left behind, and demonstrate how every California community can make itself a model of resiliency. Get involved with the Summit today to be a part of this process. Our work continues and we want to be sure your voice is heard!